An extensive real-time strategy in which we take part in the battles of World War II. The creators prepared three campaigns with a total of 21 missions and more than 15 types of units. The game resembles the Sudden Strike series. 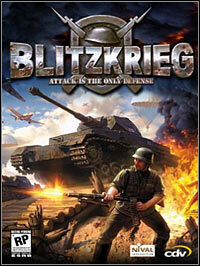 Blitzkrieg is a RTS game set in the times of World War II. The players may take part in a number of historical campaigns (such as German invasion of Poland, Russia and Tunisia, Allied landing in Italy and France or Russian struggle in Ukraine and Finland), commanding either Allied, Soviet or German forces. The game offers detailed graphics with 3D units, while the gameplay mechanics somewhat resemble those from Sudden Strike, meaning: each mission, we get a number of units and have to use them in such a way that grants us victory. Three campaigns with a total of 21 exciting missions. Over 150 kinds of vehicles and other battle machines. Over 40 sorts of infantry troops. More than 250 types of buildings and ground installations. Both single- and multiplayer (via LAN or the Internet). Possibility of taking over abandoned enemy vehicles. Building floating bridges, digging trenches, mining and demining areas, calling air support and so on. Game score 8.105 / 10 calculated out of 1197 players' votes.